Pacific Union and Empire Realty Associates now rank as the second-largest residential real estate brokerage in Contra Costa County, with combined market share of 11 percent and sales volume of more than $1.11 billion in 2017. 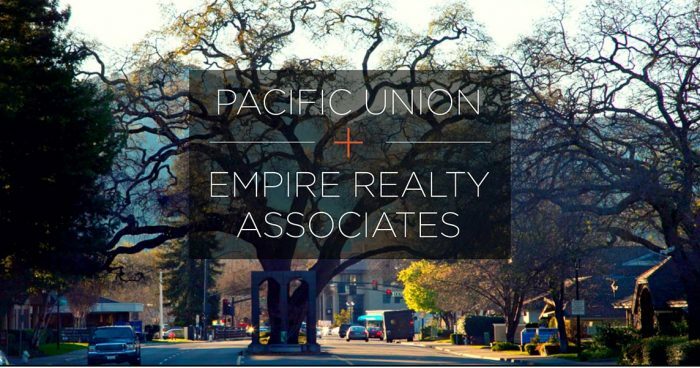 Pacific Union acquired Empire Realty Associates in October. Pacific Union and ERA grew sales volume by 38 percent for the last 12 months year over year, while the overall market volume grew by 8.6 percent. Pacific Union and ERA now capture one-quarter of the market priced above $3 million in Contra Costa County and rank as the No. 1 brokerage in that market for sales of homes higher than $3 million. In local markets in which Pacific Union and ERA operate, sales of homes priced between $1 million and $3 million have seen a notable improvement over the last year, and the companies are also capturing a greater share of that market. Contra Costa County housing market conditions have been favorable for sellers, as buyers continue to show strong demand and inventory declines. Given the region’s relative affordability and low supply of homes for sale, buyer demand will continue pushing home prices higher in the future. Following last month’s acquisition of Danville-based Empire Realty Associates, Pacific Union now ranks as the region’s second-largest brokerage, with combined market share of 11 percent in the 10-city Contra Costa County market in which the company operates. The union between the two organizations brings its total sales volume in Contra Costa County in the last year to more than $1.11 billion. The combined brokerages’ year-over-year sales volume growth for the last 12 months has outpaced the overall market’s growth by more than fourfold, with Pacific Union and ERA increasing by 37.7 percent while the overall market grew by 8.6 percent. The strong market increase is driven by particularly favorable growth in Danville and San Ramon, where Pacific Union’s 77.8 percent growth notably outpaced the market’s 7.3 percent growth. As a result, Pacific Union and ERA now comprise 8.5 percent of Danville’s market, up from 5.1 percent in the prior 12 months. The market share growth in Danville and San Ramon is the strongest increase following the acquisition. The two brokerages’ union facilitated the doubling of market share for homes priced higher than $3 million, where Pacific Union now captures over one-quarter of sales, up from 12 percent in the previous year. Growing market share in the luxury segment came amid somewhat slower overall growth of luxury home sales, which increased by only about 3 percent year to date through September. Nevertheless, Pacific Union and ERA are now the No. 1 broker in Contra Costa County’s luxury market — homes priced higher than $3 million. Sales of homes priced between $1 million and $3 million saw much stronger growth year to date in Contra Costa County markets, with about a 21 percent increase this year. Pacific Union’s growth in this price segment also outpaced the overall market’s growth, with a 41 percent increase from the 12 months prior compared with the market’s increase of 17 percent. Pacific Union and ERA now capture 12 percent of the Contra Costa County market for homes priced between $1 million and $3 million. Overall, housing markets in Contra Costa County have performed relatively well in 2017. Year-to-date home sales in Contra Costa County are up 1 percent from the year before, which is consistent with the Bay Area’s overall 2 percent year-to-date increase. Like many Bay Area markets, Contra Costa County has seen a steadily shrinking supply of homes for sale, especially affordable ones. But despite having the largest inventory of homes priced below $1 million when compared with other Bay Area regions, sales in that price range still decreased, as inventories have rapidly declined across the whole region. Nevertheless, improved inventory conditions for homes priced above $1 million helped boost activity in the higher-priced segment of the market. For instance, in cities such as Lafayette, Moraga, and San Ramon, where the median home price averages between $1 million and $1.4 million, home sales have seen double-digit percent increases, ranging between 10 percent and 20 percent year to date. The improvement in the higher end of the market is a welcome change from slower conditions seen late last year and early in 2017. However, homes in this price range have generally rebounded strongly in many communities with similar median prices. Buyer competition has also intensified in the last few quarters, and more homes are selling over the asking price when compared with the same period last year. In September, slightly more than half of Contra Costa County homes sold for more than asking price. And while competition has mostly been fierce for affordable homes, such markets have experienced intense buyer demand, especially Pleasant Hill, where two-thirds of homes have sold for more than asking price in 2017. In more expensive markets, such as Lafayette and Moraga, more than half of homes have sold for more than asking price this year. Going forward, continued buyer demand amid tight inventory levels will help fuel competition in Contra Costa County markets, where median home prices have already increased by 9 percent in 2017 and are projected to grow solidly over the next few years. For our outlook on Contra Costa County’s housing market, register for Pacific Union’s exclusive Bay Area Real Estate and Economic Forecast to 2020 webcast, which will be held on Wednesday, Nov. 15 at 5 p.m. Pacific Time.